The Trashed Romeos, led by Greg Roberson (Tiger High, Reigning Sound, Arthur Lee’s Love, Compulsive Gamblers), hail from the very epicenter of rock- n -roll, Memphis, Tn. Roberson has a pretty straight forward mission with his bands debut record Where Dreamers Never Go, to pay homage to his late friend Jim Dickinson (Bob Dylan, Rolling Stones, Big Star, The Replacements, Ry Cooder) and to focus attention on some of his hometown heroes and the obscure psychedelic garage rock 45’s they released in the mid 6o’s. 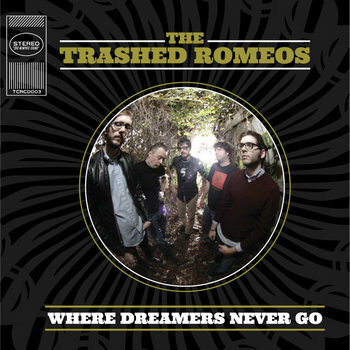 The Trashed Romeos feature, Roberson’s Tiger High band mates, Jake and Toby Vest, Rick Steff (Lucero, Cat Power) , and multi-instrumentalist and engineer Adam Hill (Big Star, Alex Chilton, White Stripes, The Raconteurs). “Where Dreamers Never Go” is a love letter to Memphis and to Dickinson's legacy. Both the Cd and Cassette packages for “Where Dreamers Never Go” include a 1968 photo of Jim Dickinson by Jim Marshall. Marshall is responsible for such iconic images as Jimi Hendrix burning his guitar at Monterey Pop and Johnny Cash flipping the bird at San Quentin.